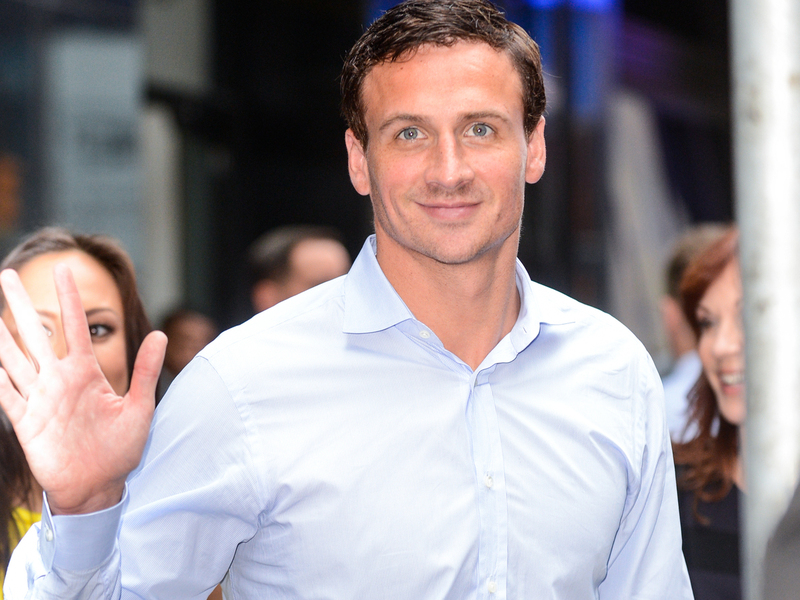 Ryan Lochte Is Suspended For 10 Months Over His Behavior At Rio's Olympics : The Two-Way Saying "the behavior of these athletes was not acceptable," the U.S. Olympic Committee levies suspensions on Ryan Lochte and three other athletes involved in an ill-fated night out in Rio. Ryan Lochte will serve a 10-month suspension from domestic and international swim competitions, the U.S. Olympic Committee and USA Swimming announced Thursday. Weeks after he left Rio's 2016 Summer Olympics under a cloud, U.S. swimming star Ryan Lochte is being punished for his behavior in Brazil, which ranged from an altercation at a gas station to making claims that he was robbed — claims that were later deemed to be false. On Thursday, the United States Olympic Committee and USA Swimming imposed a 10-month suspension on Lochte, banning him from domestic and international national swim team competitions through June 30, 2017. This means Lochte, 32, won't be able to compete in the 2017 national championships — and, by extension, he'll be ineligible for the 2017 FINA World Championships. Announcing the punishment for Lochte and three other swimmers, USOC CEO Scott Blackmun said, "The behavior of these athletes was not acceptable. It unfairly maligned our hosts and diverted attention away from the historic achievements of Team USA." The three other U.S. swimmers who were with Lochte that night — Gunnar Bentz, 20; Jack Conger, 21; and James Feigen, 26 — were hit with four-month suspensions and other punishments. None of the four swimmers will receive stipends from USA Swimming or the USOC during their suspensions; they will also be left out of Team USA's visit to the White House. And in Lochte's case, he forfeits all USOC and USA Swimming funds that were triggered by the gold medal he won at the 2016 Olympics. It's been reported that the USOC pays a $25,000 bonus to gold medalists. "Each of the athletes has accepted responsibility for his actions and accepted the appropriate sanctions," Blackmun said. He added, "We look forward to focusing our energy on the Paralympic Games and the incredible men and women representing our country in Rio." Immediately after the incident, Lochte spoke to the media about what he described as an armed robbery — but that version of events unraveled in the face of scrutiny, particularly after surveillance video contradicted Lochte. Then news emerged that Lochte had left Brazil as the police were seeking to question him further and seize his passport. On the night of August 17, police removed Conger and Bentz from a U.S.-bound plane at Tom Jobim Airport. The pair were allowed to leave one day later, after satisfying local authorities. On Aug. 19, Lochte issued a statement in which he said, "I want to apologize for my behavior last weekend, for not being more careful and candid in how I described the events of that early morning and for my role in taking the focus away from the many athletes fulfilling their dreams of participating in the Olympics." USA Swimming Executive Director Chuck Wielgus said today that the American swimmers "had lapses in judgement" and engaged in behavior that broke the code of conduct for U.S. Olympic athletes.